Broadwater Mouldings Ltd, a UK-based fibreglass composite manufacturer, has completed an upgrade to its robotic trimming department that it says will allow it to further develop its worldwide business. The investment at the company’s Suffolk facility will allow the trimming of more than 70 percent of its FRP mouldings currently manufactured for a variety of clients. The company aims to strengthen its strategic position in the targeted segments of automotive, medical and industrial as well as exploring other markets. 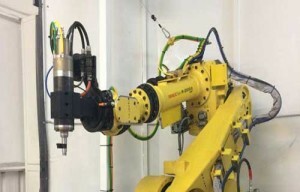 Prior to the improvement, Broadwater had two, 5-Axis CNC Robot Trimming Centres, installed separately in 2003 & 2010. The new upgrade to the original cell will increase the flexibility (more cutting tool options) and improve repeatability/accuracy. Completed by Fanuc, the system has one fixed spindle, which has 6 chucks currently, but more can be added to suit new work. The tool centre point is proven to be more accurate over long term tests compared to the spindle change system the older cell uses. With the new spindle now in place, Broadwater says both centres will offer customers a “considerably less expensive part” than manual trimming, particularly on complicated trim conditions. With the enhancements to the robotic trim shop and new business having been won recently, Broadwater says it is looking forward to an “invigorating” remainder of 2016 and “exciting and challenging” times in the future. As part of the strategic growth of Broadwater Mouldings the investment in new technology will continue the expansion, alongside the increased workforce due to new projects.